These numbers reflect estimated student expenses for the 2019-2020 school year. Amounts will change slightly from year to year, but as the cost of college increases, the scholarship packages will correspondingly increase. Your official financial aid award will be included in a letter directly from Northwestern. Outside funding will first reduce the Academic Year Work Expectation. Funding exceeding $3,300 will reduce the Northwestern grant, dollar for dollar. Northwestern requires all students to have health insurance. If you are not covered by a parental plan, the Northwestern grant will be increased to cover the amount of health insurance. Students must maintain satisfactory academic progress and meet university academic regulations to receive this award. See the Undergraduate Catalog for additional information. Annual re-application is required in order to maintain your financial aid award; you are expected to meet application deadlines in order to ensure eligibility for all need-based assistance. When determining your eligibility for Northwestern grant assistance, Northwestern uses standard costs for the academic year. The allotment for room and board reflects the average double room on campus. Your financial aid award will not change should you select a less or more expensive option. Your contribution from savings varies based on the amount of the assets. Typically, students are expected to contribute 25% of their assets during each of the four years of undergraduate enrollment. For example, a student with $4,000 in assets would be expected to contribute $1,000 toward each year of enrollment. Please visit Northwestern University’s QuestBridge financial aid page for additional information and Frequently Asked Questions. Approximately 62% of Northwestern students receive financial aid. Learn more. All need-based aid packages for first-year students are loan free. Learn more. 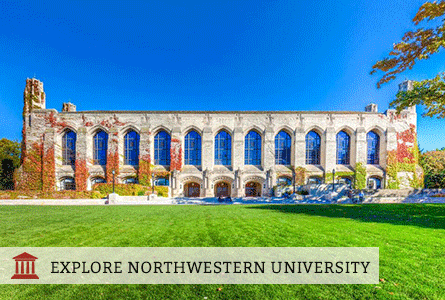 Use Northwestern's Net Price Calculator to estimate the financial aid for which you are eligible.